[S6] G.E. Cokayne; with Vicary Gibbs, H.A. Doubleday, Geoffrey H. White, Duncan Warrand and Lord Howard de Walden, editors, The Complete Peerage of England, Scotland, Ireland, Great Britain and the United Kingdom, Extant, Extinct or Dormant, new ed., 13 volumes in 14 (1910-1959; reprint in 6 volumes, Gloucester, U.K.: Alan Sutton Publishing, 2000), volume XIII, page 445. Hereinafter cited as The Complete Peerage. [S40] L. G. Pine, editor, Burke's Genealogical and Heraldic History of the Landed Gentry, 17th edition, (London, England: Burke's Peerage Ltd, 1952), page 1282. Hereinafter cited as Burke's Landed Gentry, 17th ed. 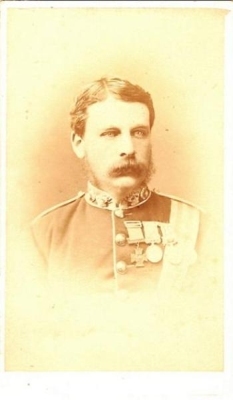 Colonel Aylmer Spicer Cameron, V.C. is the son of Lt.-Col. William Gordon Cameron. Children of Colonel Aylmer Spicer Cameron, V.C.